a well-founded modeling paradigm (Stanford Symbolic Systems Program) and a solid and well established reference framework (Zachman’s). Secured by these foundations, teams could carry on with agile and MBSE development models, helped, if and when necessary, by a comprehensive and consistent documentation freely available online. 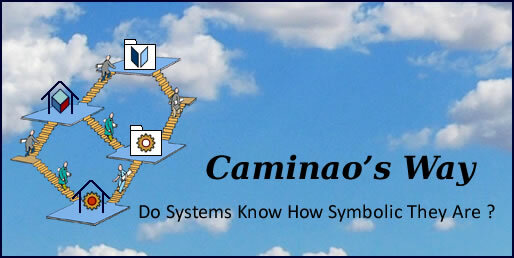 The Stanford Symbolic System Program (SSP) is built on clear and incontrovertible evidence: the purpose of computer systems is to manage the symbolic counterparts (aka surrogates) of business objects and activities. Based on that understanding, enterprise architectures can be wholly and consistently defined by maps (the models) and territories (relevant business objects and activities and their symbolic counterparts in systems). That paradigm is at the same time straightforward and aligned with the formal distinction between extensional and intensional representations, the former for requirements analysis (descriptive models), the latter for systems design (prescriptive models). A clear and compact set of unambiguous concepts encompassing the whole of enterprise architecture. Lines mix architectures artifacts (2-4) with contexts (1) and instances (5). Columns mix capabilities (1-5) with objectives (6). That simple transformation significantly improves the transparency of enterprise architectures while bringing a new light on dependencies set across layers and capabilities. As it happens, and not by chance, it neatly fits with the Pagoda architecture blueprint. Such an information backbone set across architecture layers tallies with the Pagoda architecture blueprint well known for its resilience and adaptability in unsettled environments. Agile schemes for business driven applications for which conditions of shared ownership and continuous delivery can be met. Phased schemes for architecture developments set across business processes. Whatever the development methods, the modeling paradigm will put enterprise architecture and projects management on a principled basis, and the framework will significantly enhance their integration.